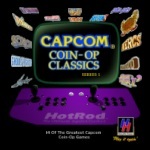 Good Deal Games - Classic Videogame STUFF - An Arcade in your Home! an ARCADE in your Home! 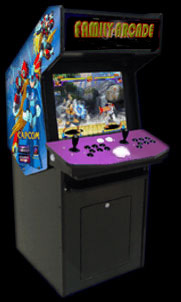 Want to play CLASSIC ARCADE GAMES in your own home or office with an AUTHENTIC ARCADE MACHINE with REAL ARCADE CONTROLS? Then this is THE MACHINE for YOU! Family-Arcade, is of commercial grade giving you years of durability. Handcrafted in the USA, with a 1 year workmanship warranty. Built solid using 3/4 inch Melamine-laminated wood (Black with matching Black T-molding trim). The Family-Arcade cabinet measures 23" wide, 32" deep, and 60" tall and weighs approx... 150 lbs when assembled. Hidden keyboard pullout drawer on sliders under control panel. 4 inch trackball, perfect for Centipede, Crystal Castles, and dozens of others! fee of $150 for delivery. Assembly required less than an hour. Includes everything you need except a screwdriver! Sold without internal computer and monitor. No CPU, monitor or speaker system are included. Dragon's Lair and Space Ace. These cabinets are custom built to order. Shipping and Handling require extra charge. with one of our home arcade experts that can answer all of your questions. PLUS, you'll receive free copies of the Arcade Ambiance audio CDs!